As a child, Alice Young loved to draw, but was captivated when she discovered ink – liquid, black and alive. As an art student, she was drawn to illuminated manuscripts and early forms of written communication. A career in graphic design followed, but while focused on computer and typographic skills, the lure of the hand-written mark remained strong, and calligraphy became an area of interest and expertise. 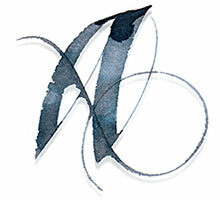 Now settled on Vancouver Island, British Columbia, her current work encompasses both verbal and non-verbal calligraphy. Inspiration comes from many sources including music, lyrics, poetry, prose, Asian art, historical western manuscripts and the dramatic beauty of the west coast landscape. 1984 Graphic Design Diploma from Georgian College School of Visual Design, Barrie, ON.